Here’s my latest The Other Side column for ConservativeHome, published here on Tuesday. I re-visited my reasons for thinking Nick Clegg should quit as party leader (while remaining as Deputy Prime Minister). But also tried to understand why he’s decided not to – and, perhaps more surprisingly, why Lib Dem MPs (whose jobs, after all, are on the line) have backed Nick up. My thanks as ever to the site’s editors, Paul Goodman and Mark Wallace, for giving a Lib Dem space to provoke – constructively, I hope. “Et tu, Stephen?” That was the message I received from one friend following my decision to write about why I think Nick Clegg should stand down as Lib Dem leader (while continuing as Deputy Prime Minister). It was a call which pitched me into an odd alliance with Tories such as Tim Montgomerie (who know their party’s fortunes depend on the Lib Dems wooing back those of our voters who’ve defected to Labour) and some of those on the centre-left in my own party (who think Clegg has relished cohabiting with Cameron far too much). Neither group are my natural ideological bedfellows. Nor do I share their dislike of the Lib Dem leader’s policies. I like him and respect him. His resilience under fire is a thing of wonder. But my admiration hasn’t altered my view: Nick Clegg should stand down. I don’t think he will do, though, and I can understand why. Put yourself in Clegg’s shoes for a moment (go on, I dare you). He has spent the past four years having ordure heaped upon him by pretty much everyone: by those 2010 Lib Dem voters who seem to have thought his commitment to negotiating a deal with the largest party wouldn’t apply if that party was the Tories; by Labour for pointing out that they hadn’t left the nation’s finances in the best state of repair; by anti-tuition fees protesters who seemed to think the Lib Dems could deliver a manifesto pledge with 9% of the MPs; and by Tories who hate being thwarted by him and Lib Dems who think he’s not thwarting them enough. Through it all he has grinned and borne it. Okay, maybe he’s not grinned much. But he has borne it, stoically. And now, as the economy ticks up, he can be forgiven for hoping the Lib Dem nadir has been reached, the depths of unpopularity plumbed, and he’s due some gratitude pay-back. He’s endured the pain, time to benefit from the gain. Last month’s local elections offer him some limited encouragement. Yes, the results were dire: my party lost another 300 councillors and received a drubbing in London, Liverpool and Manchester. But the number-crunchers tell us that such a result repeated in a general election would mean the Lib Dems returning 37 MPs. Don’t get me wrong: losing 20 seats would be bad (though at the moment I think we’d gratefully settle for such an outcome). But it is not a wipeout. And 37 MPs in a hung parliament is more valuable than (as was the case from 2005 to 2010) 63 MPs facing a majority government. This, then, is the scenario which gives Nick Clegg hope. It must also give enough of the party’s MPs hope, too, because there has been no serious challenge to his leadership from his fellow parliamentarians. And it is, after all, their jobs on the line. Their loyalty must say something about their regard for Clegg’s leadership. There is another explanation, though. If Nick Clegg were to quit now there are only two people in line to take over: Vince Cable, regarded as too aloof to be leader, and Tim Farron, whose conscious decision not to dirty his hands by taking a government post, is the subject of some resentful sniping from his colleagues. In any case, Cable has always appeared conflicted about actually wanting the job of leader (perhaps realising he’s not temperamentally suited to it); while Farron, who clearly does want to be leader, would prefer to take up the reins after the May 2015 election. So, given that Nick Clegg wants to stay, his colleagues want him to stay, and his putative successors have given him their public backing, what makes me think he should go? Oddly enough, it’s Clegg himself. He has always been determined the Lib Dems should be a party of government, reforming from within rather than protesting from without. The Lib Dem membership agrees: three-quarters want to see the party continuing to play an active role in government. Let’s imagine, then, that the May 2015 result follows the pattern of the latest local elections: a hung parliament with a significant-but-reduced group of 35-40 Lib Dem MPs. 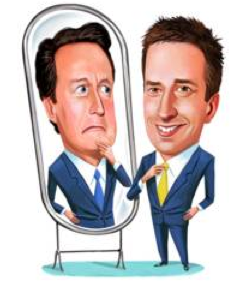 Nick Clegg would open talks with either the Tories (if they were the largest party) or with Labour (if they were). Yet both parties would know that, in such a situation, Clegg’s days would be numbered, so how much confidence could they have that he would be capable of selling any deal to his party? And that, even if he did so, the deal would endure beyond his leadership? This is an echo of what happened in 2010, when Gordon Brown increasingly became an obstacle to any prospect of a Lib/Lab deal being done. My best bet at the moment would be that the Conservatives will end up the single largest party after the next election. Yet the prospects of Nick Clegg being able to sell a second Lib/Con Coalition to Lib Dem members is minimal. He will instead be reliant on Paddy Ashdown and Cable and Farron doing the selling. If my bet’s wrong and Labour end up the largest party in a hung parliament, Clegg may find it easier to sell a Lib/Lab Coalition to party members – but he knows the media and voters will not tolerate him remaining as Deputy Prime Minister in a second Coalition undoing many of the policies he helped push through in the first Coalition. It’s rough justice. Nick Clegg has done everything in his power to show the Lib Dems are capable of being a governing party, yet one more action is needed to secure that legacy: making way for a new leader better able to form the next Coalition. 2014 Predictions Update: On New Year’s Eve 2013, I offered five predictions for 2014. One was the result of the European elections. My forecast was that Ukip would top the poll with 26%, with Labour in second place on 25%. The actual result was Ukip 27.5%, Labour 25%. Not bad, eh? I did, however, seriously under-estimate the Tories, who I thought would poll 18% (actual: 24%). And even though I low-balled my guess of the Lib Dem result, it still turned out to be over-optimistic: just one MEP against my expected three MEPs.